^ California in 1965 became the first state to name an official state rock. A 2010 effort led by State Senator Gloria J. Romero, a Democrat from Los Angeles, sought to remove serpentine from its perch as the state's official stone. Organizations such as the Asbestos Disease Awareness Organization have supported the move as the olive green rock is a source of chrysotile, a form of asbestos that can cause mesothelioma and other forms of cancer. Geologists have rallied to oppose the bill, arguing that there is no way to be harmed from casual exposure to serpentine. The bill did not reach a final vote and died in committee at the end of August 2010. 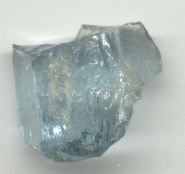 In 1986, California named benitoite as its state gemstone, a form of the mineral barium titanium silicate that is unique to the Golden State and only found in gem quality in San Benito County. ^ Colorado is the only state whose geological symbols reflect the national flag's colors: red (rhodochrosite), white (yule marble), and blue (aquamarine). 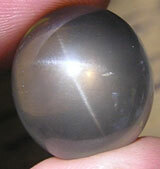 ^ Florida's State Gem, moonstone was adopted to highlight Florida's role in the United States' Lunar program which first landed astronauts on the Moon. ^ Massachusetts has 3 official state rocks: State Historical Rock (Plymouth Rock), State Explorer Rock (Dighton Rock), and State Building and Monument Stone (Granite). ^ A measure passed the Oregon Senate in March 1965 naming the thunderegg as Oregon's state rock, in a move that was supported as a way to stimulate tourism in the state. The thunderegg, a nodule-like geological structure, similar to a geode, that is formed within a rhyolitic lava flow, were said by the Native Americans of Warm Springs to have been created by thunder spirits that lived in the craters of Mount Hood and Mount Jefferson. ^ In 2009, West Virginia named bituminous coal as its official state rock, in a resolution that noted that the coal industry plays an "integral part of the economic and social fabric of the state". West Virginia joined Kentucky and Utah which also recognize coal as a state mineral or rock. The drive to name coal as an official state symbol was initiated by a high school student from Wharncliffe, West Virginia, who initiated her project at a school fair and collected 2,500 signatures on a petition that was submitted to legislators. ^ "Alabama Emblems". Alabama Emblems, Symbols and Honors. Alabama Department of Archives & History. 2001-07-12. Retrieved 2007-03-19. ^ "State of Alaska". Alaska Symbols. State of Alaska. Archived from the original on 2009-02-08. Retrieved 2009-11-12. ^ "State of Arizona Secretary of State". Arizona Symbols. State of Arizona. Retrieved 2009-11-12. ^ "State of Arkansas Secretary of State". Arkansas Symbols. State of Arkansas. Retrieved 2009-11-12. ^ "State of California Symbols". California Symbols. State of California. Retrieved 2009-11-12. ^ "State of Colorado Symbols". Colorado Symbols. State of Colorado. Retrieved 2009-11-12. ^ "Delaware Facts and Symbols". State of Delaware. Retrieved 2009-11-12. ^ "State of Florida Symbols". Florida Symbols. State of Florida. Retrieved 2009-11-12. ^ "Georgia State Symbols". Georgia Secretary of State Archives. State of Georgia. Retrieved 2009-11-12. ^ Grigg, Richard W. (1993). "Precious Coral Fisheries of Hawaii and the U.S. Pacific Islands" (PDF). Marine Fisheries Review. Seattle, Washington: National Marine Fisheries Service, NOAA. 55 (2): 54. Retrieved 29 September 2010. ^ "Illinois Facts – Symbols". State of Illinois. Archived from the original on 2006-04-15. Retrieved 2009-11-12. ^ "IHB: Emblems and Symbols". State of Indiana. Archived from the original on 2009-03-17. Retrieved 2009-11-12. ^ "Iowa General Assembly – Iowa State Symbols". State of Iowa. Archived from the original on 2010-04-30. Retrieved 2009-11-12. ^ "Kentucky State Symbols". State of Kentucky. Archived from the original on 2006-12-13. Retrieved 2009-11-12. ^ "RS 49:163.1 State Mineral". State of Louisiana. Retrieved 2012-06-12. ^ "RS 49:163 State Gem". State of Louisiana. Retrieved 2012-06-12. ^ "Maine Symbols". State of Maine. Retrieved 2009-11-12. ^ "Maryland Symbols". State of Maryland. Retrieved 2009-11-12. ^ "Massachusetts Symbols". State of Massachusetts. Retrieved 2009-11-12. ^ "Michigan's State Symbols" (PDF). State of Michigan. Retrieved 2009-11-12. ^ "Minnesota Symbols". State of Minnesota. Archived from the original on 2009-12-07. Retrieved 2009-11-12. ^ "State of Mississippi Symbols". State of Mississippi. Archived from the original on 2010-05-27. Retrieved 2010-11-01. ^ "Office of the Secretary of State, Missouri – State Symbols". State of Missouri. Retrieved 2009-11-12. ^ "State Gem, Montana Code Annotated section 1-1-501". Montana Legislature. Archived from the original on October 7, 2012. Retrieved November 9, 2011. ^ "Nebraska Symbols". State of Nebraska. Retrieved 2009-11-12. ^ "Nevada Symbols". State of Nevada. Archived from the original on 2009-03-09. Retrieved 2009-11-12. ^ "Fast New Hampshire Facts". State of New Hampshire. Retrieved 2009-11-12. ^ "New Jersey Symbols". State of New Jersey. Retrieved 2018-12-29. ^ "New Mexico Symbols". State of New Mexico. Retrieved 2009-11-12. ^ "The State Symbols". State of North Carolina. Retrieved 2011-07-11. ^ "State Symbols". State of North Dakota. Retrieved 2009-11-12. ^ "Ohio Symbols". State of Ohio. Retrieved 2009-11-12. ^ "Oklahoma State Icons". State of Oklahoma. Archived from the original on 2014-01-15. Retrieved 2009-11-12. ^ "Oregon Symbols". State of Oregon. Retrieved 2009-11-12. ^ "Rocks and Minerals". Pennsylvania Geological Survey. Retrieved 2009-11-12. ^ "Facts and History". State of Rhode Island. Retrieved 2009-11-12. ^ "South Carolina Symbols". State of South Carolina. Retrieved 2009-11-12. ^ "South Dakota Symbols". State of South Dakota. Retrieved 2009-11-12. ^ "South Dakota Mineral Law". sdlegislature.gov. Retrieved 2017-06-09. ^ "Tennessee Symbols". State of Tennessee. Archived from the original on 2014-06-25. Retrieved 2014-03-25. ^ "Texas Symbols". State of Texas. Retrieved 2009-11-12. ^ "Utah Symbols". State of Utah. Retrieved 2009-11-12. ^ "SB 352 Nelsonite; designating as state rock, etc". State of Virginia. Retrieved 2016-05-11. ^ "Student project leads to the development of new law and the Commonwealth's first state rock". Piedmont Virginia Community College. Retrieved 2016-09-14. ^ "Washington Symbols". State of Washington. Retrieved 2009-11-12. ^ "State Facts". State of West Virginia. Retrieved 2009-11-12. ^ "West Virginia House Concurrent Resolution No. 37, signed into law June 2009". State of West Virginia. Retrieved 2010-02-18. ^ "Wisconsin State Symbols". State of Wisconsin. Archived from the original on 2010-01-12. Retrieved 2009-11-12. ^ "Wyoming Emblems". State of Wyoming. Archived from the original on 2011-09-06. Retrieved 2009-11-12. ^ Steinhauer, Jennifer. "California May Drop Rock, and Geologists Feel the Pain", The New York Times, July 13, 2010. Accessed July 13, 2010. ^ Hartigan, Elizabeth. "CALIFORNIA FINDS ITSELF A REAL GEM", Chicago Tribune, March 12, 1986. Accessed July 13, 2010. ^ "State Symbols". Florida Department of State, Division of Historical Resources. 2010. Retrieved 21 March 2010. ^ via United Press International. "Senate Votes Thunderegg State Rock", Eugene Register-Guard, March 6, 1965. Accessed July 13, 2010. ^ via Associated Press. "House Approves State Rock", Eugene Register-Guard, March 26, 1965. Accessed July 13, 2010. ^ O'Caroll, Eoin. "West Virginia names coal as its official state rock", The Christian Science Monitor, June 12, 2009. Accessed July 13, 2010. Indiana state stone is a public sculpture at the Indiana Statehouse in downtown Indianapolis. It is an 85-pound (39 kg) cube of Indiana limestone that is mounted on a wooden, rotating dolly. It was carved from limestone quarried from the P. M. & B. limestone quarry located in southern Indiana. This sculpture commemorates limestone becoming Indiana's official state stone on March 1, 1971. This is a list of official symbols of the United States Commonwealth of Massachusetts. Official symbols of the commonwealth are codified in Chapter 2 of the Massachusetts General Laws.